It was October 1, 1932, when the Yankees met the Cubs at Wrigley Field for Game 3 of the World Series. Babe Ruth had a great game that day. Already before the fifth inning, he could already boast a three-run homerun that went straight through right field into the bleachers. When he went up to bat during that inning, Charlie Root was pitching. Throwing the first ball, he held one finger up and yelled, “Strike One!” After pitching another fastball, Babe held up two fingers and yelled, “Strike Two!” He then stepped out of the batter’s box and pointed. Where exactly he was pointing to is not known. Some say he was pointing at the pitcher, some think it was actually the bench of the Cubs, while still others say that he was simply pointing to the bleachers behind centre field. He was pointing to where he was planning to hit the ball, and that’s exactly where he did hit it. When Babe hit the shot that he had called, the count had been 2-2. 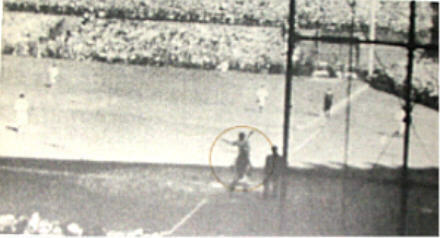 Johnny Moore had been standing in centre field, and he had begun to move farther back to stop the ball when Ruth hit it. He stopped however as he watched the ball disappear into right field. The ball was hit 436 feet away from home plate where Babe was standing and it was the 15th homerun that had been hit during that World Series. It was also the longest ball that had been hit in Wrigley Field until that time. Babe Ruth's called shot was the home run hit by Babe Ruth of the New York Yankees in the fifth inning of Game 3 of the 1932 World Series, held on October 1, 1932 at Wrigley Field in Chicago. During the at-bat, Ruth made a pointing gesture, which existing film confirms, but the exact nature of his gesture is ambiguous. Although neither fully confirmed nor refuted, the story goes that Ruth pointed to the center field bleachers during the at-bat. It was supposedly a declaration that he would hit a home run to this part of the park. On the next pitch, Ruth hit a home run to center field. There is no dispute over the general events of the moment. All the reports say that the Cubs' "bench jockeys" were riding Ruth mercilessly, and that Ruth, rather than ignoring them, was "playing" with them through words and gestures. The longtime debate is over the nature of one of Ruth's gestures. It is unclear if he pointed to center field, to the pitcher, or to the Chicago Cubs bench. Even the films of the at-bat (by amateur filmmaker Matt Miller Kandle, Sr.) that emerged during the 1990s have not allowed any definitive conclusions. Charlie Root's first pitch to Ruth was a called strike. Ruth then looked over at the Cubs dugout and raised his right hand, and extended one of his fingers. Root missed with the next two pitches, but the next pitch was a called strike, and the crowd again cheered loudly. Ruth then waved back at the Cubs dugout and held up two fingers. He began to shout at Root, and it is at this point Ruth definitely made a pointing gesture in the direction of Root, center field, or to the Cubs bench. 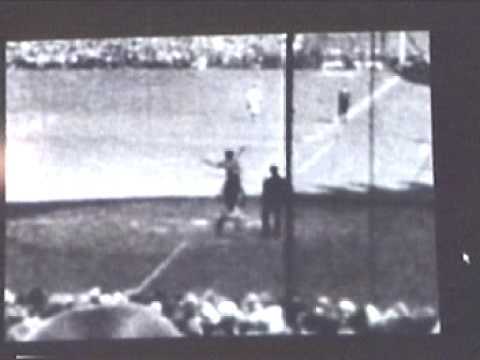 Newsreel footage (available in MLB's 100 Years of the World Series) shows that Ruth was crowding the plate and nearly stepped forward out of the batter's box, inches away from risk of being called "out" (Rule 6.06a). The film also shows that as he rounded first base, Ruth looked toward the Cubs dugout and made a waving-off gesture with his left hand; then as he approached third, he made another mocking gesture, a two-armed "push" motion, toward the suddenly quiet Cubs bench. Many reports have claimed that Ruth "thumbed his nose" at the Cubs dugout, but the existing newsreel footage does not show that (if it occurred, it might have been considered vulgar and would have been edited out). Sitting in a box behind home plate, Franklin Delano Roosevelt, soon to be elected 32nd President of the United States, even had a laugh as he watched Ruth round the bases. When he crossed home plate, Ruth could no longer hide his smile, and he was patted by his exuberant teammates when he reached the Yankees dugout. Despite these distracting theatrics, Root was left in the game; but for only one pitch, which Lou Gehrig drilled into the right field seats for his second homer of the day; Root was then relieved. The Yankees won the game 7-5, and the next day they finished off the demoralized Cubs 13-6, completing the four game sweep. The "called shot" homer was Ruth's last World Series hit.